Is John Chow Really Getting Fat? 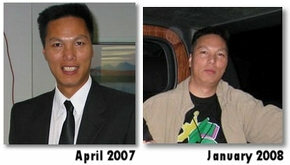 Gary Conn made a post this week on whether or not the famous Dot Com Mogul, John Chow has put on weight recently. Between all the fine dining John does and all the time he spends behind a keyboard, I think Gary made a good observation. Luckily for John, as well as the other flabby bloggers out there, Israel from FatManUnleashed.com has released a free Blogger Proof Workout eBook. The Digg Reel, is a new weekly show that will highlight the most popular videos submitted to Digg.com. It’s a real time saver for many video fanatics, for there is no need to watch every popular video and read hundreds of comments. The show will include 10 to 15 minutes of clips from the most popular videos on Digg that week as voted by the users of the popular news ranking site. John actually shed some light on the situation. You can find his comment here. Oh the jackass that “Do I know how to roll or what” as eaten to much. To much reviews of restaurants and to little real blogging. That’s why he is fat. Although I have nothing against other fat people. I might be fat myself. Heh, he deserves to be. In South East Asia, it’s seen as quite a positive thing – sign of status.